The reversible condensation of RNA-binding proteins into liquid protein drops creates RNA-splicing complexes, stress granules, and more. The process of liquid-liquid phase transition (LLPS) is tightly regulated, because when it goes rogue, proteins aggregate and neurons die. Two new structural studies shed light on how phosphorylation controls LLPS. In the April 2 Nature Structural and Molecular Biology, researchers led by Cong Liu at the Chinese Academy of Science in Shanghai, Xueming Li at Tsinghua University, Beijing, and Dan Li at Shanghai Jiao Tong University, report that phosphorylation of the RNA-binding protein FUS disrupts formation of a reversible amyloid–like structure that may facilitate phase transition. The structure occurs in a region of low complexity—domains with an itch to undergo LLPS and aggregate. In the second study, Nicolas Fawzi’s lab at Brown University in Providence, Rhode Island, reports that phosphorylating a single serine in TDP-43 disrupts this protein’s oligomerization and phase separation. Curiously, the serine occurs in the highly structured N-terminal domain of this RNA-binding protein. This work, which appeared in the March EMBO Journal, suggests that ordered structural domains matter to phase transition, too. “These are both very exciting papers that enhance our mechanistic understanding of TDP-43 and FUS phase transitions,” James Shorter of the University of Pennsylvania in Philadelphia emailed to Alzforum. The pathological aggregation of RNA-binding proteins FUS and TDP-43 are a feature of amyotrophic lateral sclerosis, frontotemporal dementia, and Alzheimer’s disease. 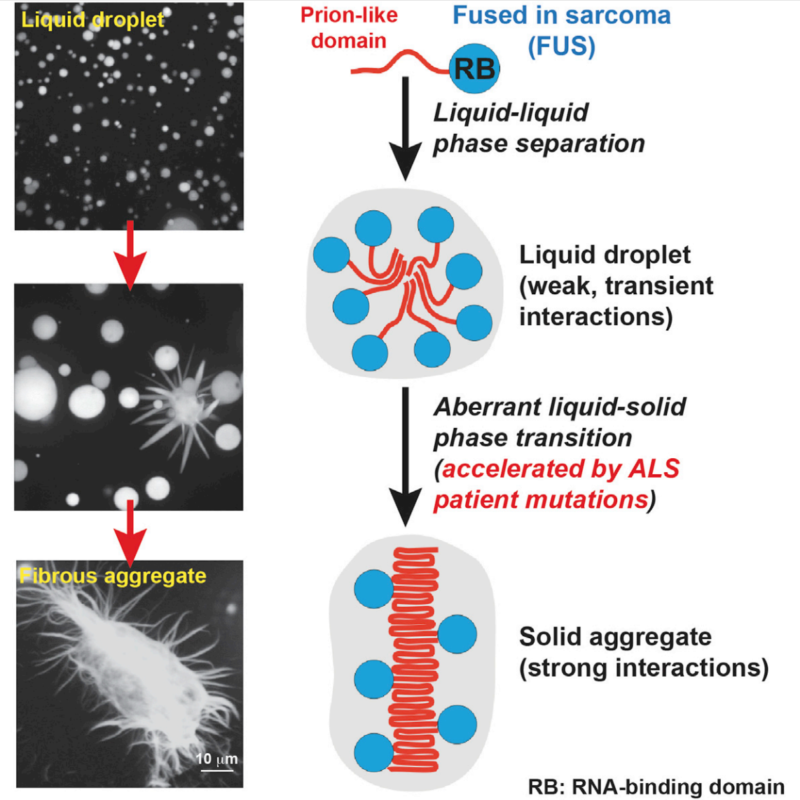 The proteins share a penchant for liquid-liquid phase transition (LLPS), condensing into liquid assemblies that support RNA processing. Pathological aggregates can form inside such droplets, but the structural drivers for phase transition and aggregation are not clear. Proteins that undergo LLPS typically contain intrinsically disordered protein sequences, aka low-complexity domains (LCDs). Recent work from David Eisenberg’s lab at University of California, Los Angeles, uncovered a protein-protein interaction motif in LCDs called low-complexity, aromatic rich kinked segments. LARKS for short, these peptides form fibrils with a reversible amyloid structure (see Feb 2018 news). Scientists have not spotted these reversible structures in liquid protein droplets, but suspect that they facilitate LLPS (Kato et al., 2012; Sep 2017 news). In their new study, Liu and colleagues reprise some of Eisenberg’s work, and add a new wrinkle. By mutational analysis, first authors Feng Luo, Xinrui Gui, and Heng Zhou identified two tandem, tyrosine-containing sequences, SYSGYS and SYSSYG, that are required for LLPS by a purified FUS LC domain. As Eisenberg had shown, the isolated peptides were able to arrange into amyloid-like fibrils, and the Liu group dubbed them reversible amyloid core 1 (RAC1) and RAC2. The fibrils looked like pathogenic amyloids, but they readily dissolved and reformed when the investigators shifted the temperature back and forth between 4°C and 50°C. For RAC1 fibrils, the investigators achieved the best resolution to date for a cryoEM structure, at 0.73 Ångstrom resolution. Rather than the extended peptide backbone seen in the bona fide amyloid structure, the RAC1 backbone kinks at the glycine. As a result, the peptide adopts a coil conformation, where the second tyrosine swings back and closes a loop by hydrogen bonding with the first tyrosine. The first tyrosine also hydrogen-bonds with the initial serine in the neighboring peptide. Based on that structure, the investigators predicted that phosphorylation of the last serine, in this case Ser42, would destabilize the coil, and possibly disrupt LLPS. Indeed, phosphorylation of the FUS LCD, or mutating Ser42 to the phosphomimetic aspartate suppressed LLPS. In addition, RAC1 peptides phosphorylated at Ser42 formed no fibers in vitro. In contrast, adding phosphate at Ser39, which is not part of the coil locking or sheet interface, had no effect on fibril formation. “The RAC1 structure provides a delicate switch for phosphorylation regulation, and thus may play a role in the regulation of stress granule assembly,” Liu wrote in an email to Alzforum. The RAC2 peptide adopted a more traditional cross-β amyloid structure, but with an unusual “wet interface,” where water molecules infiltrated the space between the mating sheets. Compared with amyloid fibrils, RAC2 fibrils had a smaller buried surface area, looser interdigitation of the side chains between sheets, and the sheets were farther apart. RAC2 fibrils were less stable than RAC1 assemblies; warming them from 4°C to room temperature made them fall apart whereas RAC1 fibrils withstood higher temperatures. The RAC1 sequence and structure are identical to one of the LARKs from Eisenberg’s lab, where Liu and coauthors Dan Li and Minglei Zhao all trained (see Feb 2018 news). The RAC2 structure differs, but Eisenberg told Alzforum that could be because the Chinese group used a shorter peptide and slightly different crystallization conditions. The extreme lability of the RAC2 fiber makes him question its relevance. “The effects of phosphorylation are interesting, and their implication is that modification would break up these weak fibers. That fits with earlier studies on the FUS protein,” Eisenberg said (see, for example, Han et al., 2012; Aug 2017 news). To be sure, it’s not clear yet what role RACs, or LARKS, play in phase separation of proteins. Liu told Alzforum he believes they do contribute to self-assembly of FUS proteins. That does not mean RAC interactions are the sole force mediating phase separation. “Weak interactions cooperate in FUS self-assembly. When and how RAC interactions kick in and interplay with other interactions, and how granule formation benefits from reversible amyloid formation, are important questions to be answered,” Liu wrote in an email. While most studies of LLPS focus on LCDs, Fawzi’s inspected the other end of TDP-43. First authors Ailin Wang and Alexander Conicella uncovered a regulatory phosphorylation site in the protein’s N terminal domain (NTD), and showed it controls TDP-43 polymerization, LLPS, and RNA splicing. Their NMR structure of an NTD dimer explains how phosphorylation disrupts the polymer. In TDP-43, the LCD sits 200 amino acids away in the C-terminus. Studying the whole of TDP-43 has been difficult because the full-length, purified protein aggregates. But Conicella found a way to express and purify the protein in a more agreeable form by hooking the highly soluble maltose-binding protein to the C terminal, LCD end of the protein. When he clipped off the MBP tag, the protein immediately phase separated. However, TDP-43 bearing an N-terminal Ser48Glu phosphomimetic mutation failed to undergo LLPS under the same conditions. The Ser48Glu change had consequences for protein function in cells, too. When expressed overnight in 293T cells, the mutant partitioned into spherical inclusions, but the droplets were less concentrated and more fluid than those containing normal protein. 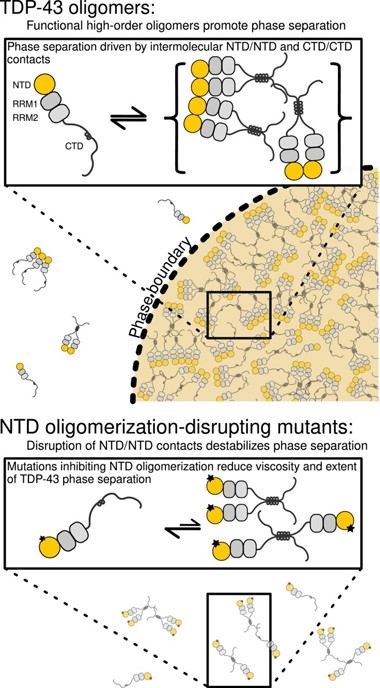 The mutant disrupted partitioning of wild-type protein, suggesting normal LLPS require a direct protein-protein interaction involving the NTD. The mutant was less effective at RNA splicing, as well. In vitro, the NTD formed linear polymers up to 10 units long. Solution NMR of a dimer revealed a head-to-tail linear polymer, with Ser48 sitting smack in the interface. This suggests that phosphorylation regulates polymer assembly, which, in turn, regulates protein function. Could phosphorylation prevent pathological aggregation? That’s unclear. In contrast to previous suggestions that NTD association prevents harmful aggregation of the C-terminal (Afroz et al., 2017; Mompean et al., 2017), the new study predicts that oligomerization would actually favor C terminal aggregation. Douglas Laurents, at the Instituto de Química Física Rocasolano, Madrid, did some of that previous work, and finds Fawzi’s conclusion attractive. “It would explain many previous studies, which showed that the N-terminal domain is needed both for physiological association, such as healthy association into the stress granule, as well as harmful aggregation,” Laurents wrote in an email to Alzforum. Fawzi knows that a fraction of Ser48 becomes phosphorylated in cells, but not which kinase is responsible, or how it is regulated. It is also unclear how the NTD figures in pathogenic aggregation, since most TDP-43 in cytoplasmic inclusions consists of cleaved C-terminal domains. A lot more work needs to be done to understand the order of events in the disease cascade, he said. Luo F, Gui X, Zhou H, Gu J, Li Y, Liu X, Zhao M, Li D, Li X, Liu C. Atomic structures of FUS LC domain segments reveal bases for reversible amyloid fibril formation. Nat Struct Mol Biol. 2018 Apr;25(4):341-346. Epub 2018 Apr 2 PubMed. Wang A, Conicella AE, Schmidt HB, Martin EW, Rhoads SN, Reeb AN, Nourse A, Ramirez Montero D, Ryan VH, Rohatgi R, Shewmaker F, Naik MT, Mittag T, Ayala YM, Fawzi NL. A single N-terminal phosphomimic disrupts TDP-43 polymerization, phase separation, and RNA splicing. EMBO J. 2018 Mar 1;37(5) Epub 2018 Feb 9 PubMed. Kato M, Han TW, Xie S, Shi K, Du X, Wu LC, Mirzaei H, Goldsmith EJ, Longgood J, Pei J, Grishin NV, Frantz DE, Schneider JW, Chen S, Li L, Sawaya MR, Eisenberg D, Tycko R, McKnight SL. Cell-free formation of RNA granules: low complexity sequence domains form dynamic fibers within hydrogels. Cell. 2012 May 11;149(4):753-67. PubMed. Han TW, Kato M, Xie S, Wu LC, Mirzaei H, Pei J, Chen M, Xie Y, Allen J, Xiao G, McKnight SL. Cell-free formation of RNA granules: bound RNAs identify features and components of cellular assemblies. Cell. 2012 May 11;149(4):768-79. PubMed. Afroz T, Hock EM, Ernst P, Foglieni C, Jambeau M, Gilhespy LA, Laferriere F, Maniecka Z, Plückthun A, Mittl P, Paganetti P, Allain FH, Polymenidou M. Functional and dynamic polymerization of the ALS-linked protein TDP-43 antagonizes its pathologic aggregation. Nat Commun. 2017 Jun 29;8(1):45. PubMed. Mompeán M, Romano V, Pantoja-Uceda D, Stuani C, Baralle FE, Buratti E, Laurents DV. Point mutations in the N-terminal domain of transactive response DNA-binding protein 43 kDa (TDP-43) compromise its stability, dimerization, and functions. J Biol Chem. 2017 Jul 14;292(28):11992-12006. Epub 2017 May 31 PubMed. Copyright 1996–2018 Biomedical Research Forum, LLC. All Rights Reserved.